Coming home from a hard day at work only to find that your dog has chewed up your furniture or something else of value can feel like someone just kicked you in the stomach. There are few things more frustrating than to have something of value destroyed by your friend – The Dog. You don’t want to come home to find this. You left out a favorite pair of shoes that your Buddy decided to make a new chew toy, or worst yet, your dog decided to chew the legs of your chairs or the cushions from the place you visualized dropping down on as soon as you got home. So, how to stop a dog from chewing furniture and everything of value while you are gone for a few hours? There are a few things you can do to protect your home and valuables. Don’t feel like a failure if this happens to you. I think most dog owners have experienced this behavior at some point. I remember waking up one night to my Golden Retriever chewing on the corner of my nightstand for no apparent reason. He wasn’t even a puppy. He is now long gone and I have had 2 Golden Retrievers since him, but I am reminded every night when I see his artwork he left behind. Let’s take a look at ways to change or avoid our dogs from chewing on furniture and other things around the house. An exhausted dog is a well-behaved dog. You might have to get up 30 minutes earlier to take your dog for a walk before you leave for work, but your dog will probably come back and take a nice long nap. You will probably feel better starting your day from getting some fresh air as well. Most times when dogs get themselves into trouble, it is as soon as you walk out the door. Giving your dog a 30-minute walk before you leave will keep them calmer when you go, and they will be ready to settle down and sleep. All dogs like having something to chew on, especially puppies. Provide your dog with something that they like to chew on and giving them their chew as you walk out the door will help them realize what they should be chewing on. This can be raw hides, bones, or toys they enjoy. Just make sure that you feel they are safe with whatever you give them and that there are no choking hazards with their chew toy. Put your shoes away before leaving the house. I understand that you can’t put your furniture away to keep your dog from chewing it, but you can make sure you don’t have any shoes lying around or clothing. 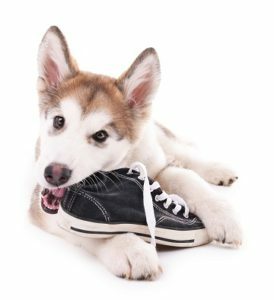 Many times when your dog chews your clothes or shoes, it is because you left your dog behind instead of taking them along. They are mad at you. There are many great interactive toys available that will keep your dog busy and help prevent dog boredom. Bored dogs get into trouble. Get your dog an interactive toy that has treats in it that will dispense out as your dog plays with the toy. Your dog will become so busy trying to get the treats out, that they will completely forget about chewing on your furniture. Usually, as time passes, they will be less stressed out about you being gone. Crate training is especially good for puppies and young dogs, but work great for any dog that can’t be trusted on their own. Provide them with toys, things to chew on or interactive toys to help the time go faster for them while they are in the crate. Here is information to help you get the right size dog crate and what you need to know to buy dog crates if you need any help or suggestions. If you aren’t a fan of putting your dog in a crate when you are gone, dog gates are another option you can use. There are many great styles for different situations and you can take a look at the dog gate buying guide to help find one that works for your home. Remember, whatever is within the gated area will be fair game for your dog to chew on, so use caution when choosing the right spot to put your gate. It helps to make the furniture unpleasant to chew on. Using an anti chew spray works great to deter dogs from chewing on anything that you don’t want your dog chewing on. There is a wide variety that you can choose from. You can check out anti chew sprays on Amazon. I have used these, and they have worked great. I have even sprayed them on outdoor plants I was trying to keep my dog away from. You do need to reapply whenever it rains though. The product that I have been using is Grannick’s Bitter Apple. I have had nothing but happiness with this product. My dogs have never chewed on anything that I have sprayed the Bitter Apple on. It is a very inexpensive product that works great to protect anything you are trying to keep your dog from chewing on. It just takes a few sprays of the product, and you will notice that your dog isn’t happy with the taste immediately. You can even use Grannick’s on your dog’s paws if they are excessively chewing their paws. 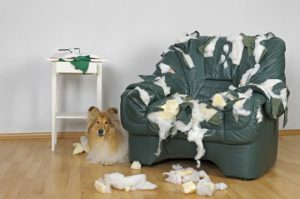 If you are looking for ways on how to stop a dog from chewing furniture or stop your dog from chewing on things around the house, you should see there are several options. Exercise has always been a savior that has worked for me. Get your dog good and tired before you leave the house. If you have a puppy or a younger dog that still can’t be trusted, crates work great. They will help keep your dog safe while you are gone, and it will help protect your dog from chewing on your furniture. Dog gates are another great option, but if your dog is really naughty, it might be hard finding a good location to put the gate that will still keep your dog away from things you might not want chewed on. The antichew sprays really do work. They are fairly inexpensive, so you should be able to at least try the product to see if it works for you. 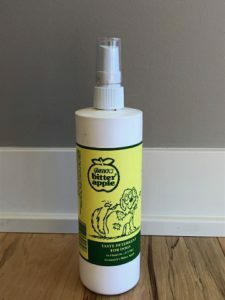 I have had great success with the Bitter Apple spray, but there are many other great products out there. Usually it is just a phase they are going through, and it will pass, you just have to protect your furniture until that time. If you have any questions or comments, please leave them below, and I will get back with you. 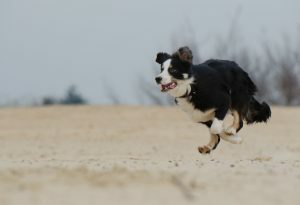 You can follow justforyourdog.com on Pinterest or FaceBook.